One of the key challenges in our work pushing for reform of the academic system and the scientific enterprise is convincing those resistant to change that there is a problem. 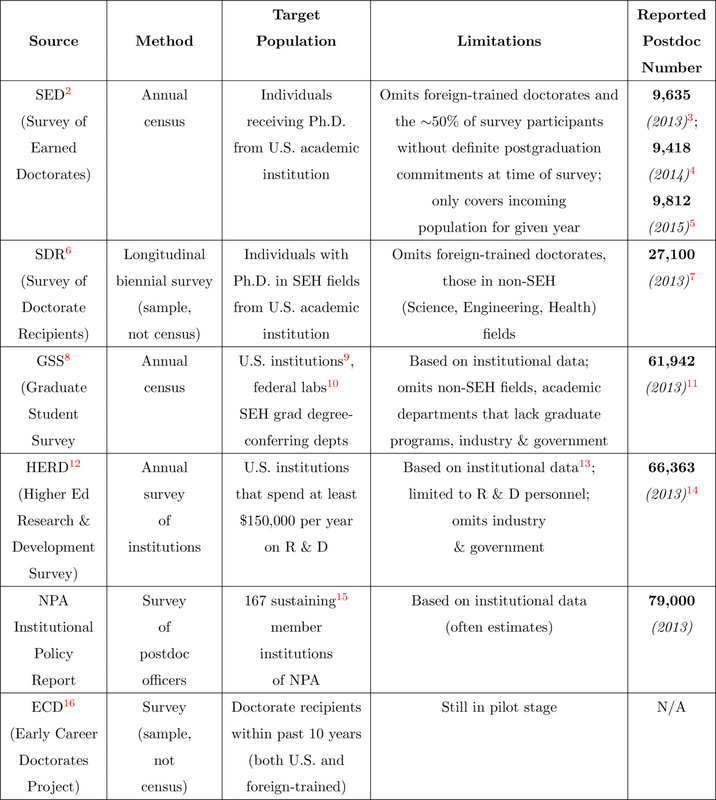 Part of the issue in dealing with this is the debate about the quality/quantity of data available about the scientific workforce; with almost no tracking of career outcomes for graduate students and postdocs, and the variable degree to postdocs are administered in the U.S. hindering data collection efforts, a key argument against reform is the scarcity of data with which to make informed changes. To combat this, we have started working more closely with those in science policy and the social sciences who work on these issues, and recently teamed up with labor economists at the U.S. Census Bureau/NIH to look at the U.S. biomedical workforce using census data. We have produced a comprehensive analysis of the historical size, shape and demography of the biomedical workforce in our working paper, “Preparing for the 21st Century Biomedical Research Job Market: Using Census Data to Inform Policy and Career Decision-Making” which is discussed in our comment in Nature out today, “The New Face of Science in the U.S.”. Our hope is this analysis will be of use to policy-makers, and can also help to inform junior and senior scientists alike (particularly in academia) about the realities we currently face. We used the Integrated Public-Use Microdata Series-USA (IPUMS-USA, University of Minnesota) dataset, which contains data from both the decennial census and the annual American Community Survey (ACS), to look at biomedical scientists in the U.S. (for more details on the methods, see Appendix 2. Data and Methods in the preprint). The data shows the continuing growth of the workforce, and most particularly the growth in the number of trainees – the number of graduate students in particularly is expanding dramatically and the workforce is increasingly younger overall, but increasingly non-academic; contrast this to academia, where the number of older researchers is increasing (the “graying” of the workforce, see our interview with lead author Misty Heggeness about the paper “Policy Implications of Aging in the NIH-Funded Workforce“). Although the workforce is increasingly diverse, there’s still a long way to go. Work elsewhere has shown that diversity is highest at early academic career stages, and women and minorities are under-represented in leadership and independent-research positions (see “Measuring Diversity of the National Institutes of Health-Funded Workforce“). Despite a large pool of junior scientists from which to draw, as things currently stand it may take a very long time for faculty diversity to increase significantly (see “Decoupling of the minority PhD talent pool and assistant professor hiring in medical school basic science departments in the US“). We show also that women are less likely than men to have a non-working spouse able to shoulder responsibilities at home (in Panel C in our Nature comment, you can see that men aged 30-39 are 7 times more likely to have an unemployed spouse), and that they are less likely overall to be married than men; but when they are married, they are more likely to have a spouse with a professional degree, who is also in the biomedical workforce. In addition, the age when many researchers have young children intersects with early career stages and transitioning to independence. We also discuss in depth the problems with data on postdocs – Appendix 1, Table 1 (preview below) lays out the various estimates for the population of all postdocs, and we make the case for more to be done to make sure postdocs are counted, and tracked, to ensure a sustainable and diverse research enterprise at the faculty level. While data is in somewhat short supply, there is still plenty of data highlighting the problems we face. Most junior biomedical scientists do not go into academe. Movement of junior scientists into non-academic positions, and increasingly into positions abroad, needs to be addressed in training. We have specifically published our work as a preprint in the Self-Journal of Science to make it available more quickly for discussion, and to provide a format on which readers can comment directly, allowing us to make revisions and clarifications. In the near future we will be using it as a basis for highlighting the plentiful research produced by the science policy community, by curating a self-journal highlighting work in this field. We hope the data is of interest and useful to junior and senior scientists alike about our current biomedical enterprise, and are looking to investigate the wider implications for academia as a whole.